The Bad Boys spinoff pilot that NBC rejected last month has officially been ordered as the cable giant's first original scripted series. 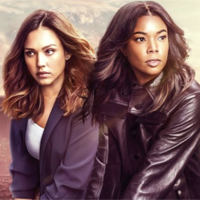 The Jerry Bruckheimer-produced L.A.'s Finest has received a 13-episode order that will premiere in 2019 on Charter's Spectrum platform. L.A.'s Finest has Union reprising her Bad Boys role as Syd Burnett, now an LAPD detective, who is partnered with Alba's Nancy McKenna, a working mom. Bot have complicated lives. “Charter has a strong passion for the project and we could not be more excited. Immediately we knew this innovative new platform was absolutely the right home for L.A.’s Finest,” said Jeff Frost, president of Sony Pictures Television. Charter has been interested in scripted original series since hiring former NBC executive Katherine Pope earlier this year.